WINTERVILLE—Should the current trend of success continue for Pitt Community College’s National Society of Leadership and Success (NSLS) chapter, the student organization will need a building on campus to showcase its awards. 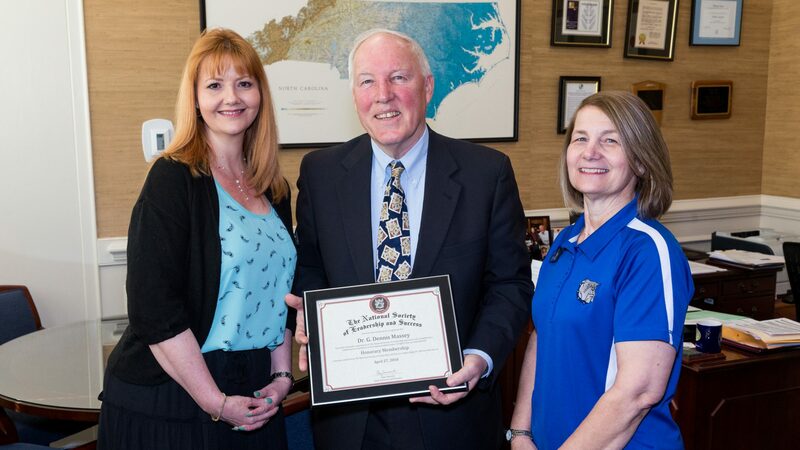 Already the recipient of several prestigious honors for its efforts to ‘build leaders who make a better world,’ the PCC group received a Distinguished Chapter Award from the national organization in May. At the same time, Faith Fagan, an administrative assistant within the PCC Public Services and Fine Arts Division, was awarded $300 as NSLS Advisor of the Year. Each year, the nation’s largest leadership honor society recognizes five chapters for making a significant impact on their members and communities. As one of this year’s Distinguished Chapter Award honorees, PCC’s Sigma Alpha Pi chapter of NSLS received $700 in recognition of its outstanding chapter development, membership support, leadership training, and active engagement in campus and community volunteerism. Though she has worked at PCC for more than 20 years, Fagan has been co-advisor of the college’s NSLS chapter in just the past two. Her role, she says, is to provide students with the support, guidance and resources they need to hone their leadership skills and achieve success academically, personally and professionally. “I am honored to have been named NSLS Advisor of the Year,” Fagan said. “I feel this award was a direct result of the support I have received from my supervisor, Dean Dan Mayo, my NSLS co-advisor Lynda Civils, and all of the members of PCC’s chapter. Starting with the NSLS Founder’s List Award in August for having completed nine of the national organization’s 10 Pillars of Success during the 2016-17 academic year, Sigma Alpha Pi has been on the receiving end of a steady stream of accolades. In December, NSLS named PCC student Amira Ali as North Carolina’s recipient of its State of Mind Award. Ali, a member of Sigma Alpha Pi, received $1,000 through the honor, which is given to one NSLS member in each state for initiating or participating in a project that benefits the community. Ali’s award was the result of her extensive volunteer work at The Oakwood School in Greenville, despite having many responsibilities as an Early Childhood Education student and mother of four. During the PCC Student Talent and Recognition (STAR) Awards Ceremony in April, Sigma Alpha Pi was once again the big winner. The organization claimed three top honors at the event: the Dr. G. Dennis Massey Mark of Distinction Award, the Outstanding Service/Volunteer Program of the Year, and a Distinguished Merit Award. To be eligible for NSLS membership at Pitt, students must have at least a 3.3 GPA. They must also complete orientation and leadership training sessions, perform community service, and attend three speaker broadcast lectures and three success networking team meetings. Established nationally in 2001, NSLS was founded for the purpose of creating lasting positive change for students wanting to develop strong leadership skills through community action, volunteerism and personal growth.